Forget for a moment that everyone wants to play Monterey County golf courses for bragging rights. 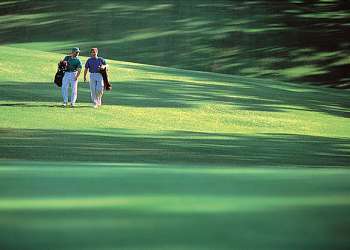 Instead picture a vibrantly beautiful course that happens to be tucked into a verdant, green valley. Deer and other wildlife are present, and the serenity and peace are palpable. It&apos;s almost hard to imagine. Luckily just inland from Carmel, Carmel Valley golf provides this experience on four courses. Carmel Valley golf courses offer many options. Take advantage of the "Member for a Day" package at the Golf Club at Quail Lodge, which hosts the USGA Senior Amateur and California Women&apos;s Amateur Championships. As a guest of Carmel Valley Ranch, play the newly restored champion course.